The increasing prevalence of numerous cutaneous malignancies, especially non-melanoma skin cancer, including basal cell carcinoma and squamous cell carcinoma, have influenced the market for basal cell carcinoma treatment substantially across the world. Prolonged sun exposure, along with various factors, such as fair complexion, exposure to chemical carcinogens, including arsenic, and genetic issues are increasing the risks of developing basal cell carcinoma in human significantly. The increase in geriatric population, giving rise to numerous skin diseases, such as actinic keratosis and other non-melanoma skin malignancies, is another important factor that has been fueling the demand for basal cell carcinoma treatment substantially. In addition to these, the market is expected to gain considerably from the changing lifestyle of people in developing economies over the coming years as it is anticipated to drive demand for better disease treatments, which in turn, is likely to provide lucrative opportunities for the companies operating in the global basal cell carcinoma treatment market. In 2016, the opportunity in the global market was US$4.66 bn. Progressing at a CAGR of 9.20% over the period from 2017 to 2025, the market is likely to reach US$10.14 bn by 2025 end. Broadly, the global market for basal cell carcinoma treatment is evaluated on the basis of the type of treatment and the end user. Based on the type of the treatment, the market is classified into surgeries, drugs, and several other types of treatments. Excision, electrodessication and cutterage (ED&C), Moh's surgery, and cryosurgery are the most prominent types of surgeries used for the treatment of basal cell carcinoma. In terms of drugs, topical treatment and advanced medication are extensively in this treatment. Other basal cell carcinoma treatments include radiation therapy, photodynamic therapy (PDT), and laser therapy. Surgeries has proved to be more effective among all the treatment methods for basal cell carcinoma, leading to their high demand. Analysts expect the trend to remain so over the next few years, ensuring the dominance of the surgical segment. Hospitals and specialty clinics have surfaced as the prominent end user of basal cell carcinoma treatment solutions across the world. The global basal cell carcinoma treatment market is also analyzed on the basis of the geography. North America, Europe, Asia Pacific, Latin America, and the Middle East and Africa are considered as the prominent geographical segments of this market. North America, which is the current market leader, is expected to remain dominant over the next few years. The presence of a well-established medical and healthcare infrastructure, increasing expenditure on healthcare, and the high prevalence of basal cell carcinoma in this region are likely to boost the growth of the market for basal cell carcinoma treatment in North America. The global market for basal cell carcinoma treatment is led by Sun Pharmaceuticals Ltd., Valeant Pharmaceuticals International Inc., Mylan N.V., F. Hoffmann-La Roche Ltd., Merck & Co. Inc. With only a few players, the market is consolidated; however, the rivalry between these players characterizes the competitive landscape prevalent in this market. This report on the global basal cell carcinoma treatment market analyzes the current and future prospects of the market. The report comprises an elaborate executive summary, including a market snapshot that provides overall information of various segments and sub-segments. The research is a combination of primary and secondary research. Primary research formed the bulk of our research efforts along with information collected from telephonic interviews and interactions via e-mails. Secondary research involved study of company websites, annual reports, press releases, stock analysis presentations, and various international and national databases. A detailed qualitative analysis of factors responsible for driving and restraining market growth and future opportunities has been provided in the market overview section. This section of the report also provide insights into the key trends of the basal cell carcinoma treatment market such as augmentation in clinical trials, increase in private insurance and favorable reimbursement scenario. The key market indicators influencing global basal cell carcinoma treatment market taken into consideration including cost constraints and regulatory landscape. The report provides market size in terms of US$ Mn for each segment for the period from 2015 to 2025, considering the macro and micro environmental factors. 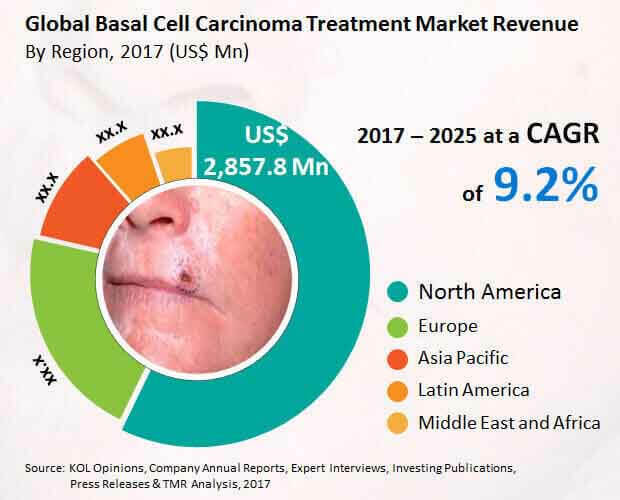 Growth rates for each segment within the global basal cell carcinoma treatment market have been determined after a thorough analysis of past trends, demographics, future trends, technological developments, and regulatory requirements. It also includes value chain analysis of the global basal cell carcinoma treatment industry. A pipeline analysis highlighting major pipeline drugs is also included in the report. Market revenue in terms of US$ Mn for the period between 2015 and 2025 along with the compound annual growth rate (CAGR %) from 2017 to 2025 are provided for all the segments, considering 2016 as the base year. The year on year growth of global basal cell carcinoma treatment market for each segment is also reflected. Additionally, market related factors such as technological advancements, changing environmental factors, and growing disease awareness initiatives and greater affordability for patients in various geographies and historical year-on-year growth have been taken into consideration while estimating the market size. Based on treatment type, the global basal cell carcinoma treatment market has been segmented into surgical (surgical excision, electrodessication & cutterage (ED&C), Moh's surgery, and cryosurgery), drugs (topical treatment, advanced medication, and other) and others. Based on end-user, the market has been segmented into hospitals, specialty clinics, and others. Hospitals segment is expected to remain dominant during the forecast period. Geographically, the global basal cell carcinoma treatment market has been segmented into five regions: North America, Europe, Asia Pacific, Latin America, and Middle East & Africa. In addition, the regions have been further segmented into major countries in each of the regions. These include the U.S., Canada, the U.K., Germany, France, Italy, Spain, China, Australia, Japan, Brazil, GCC, South Africa and Mexico. The report includes market attractiveness analysis of the major segments that provides a thorough analysis of the overall competitive scenario in the global basal cell carcinoma treatment market. It profiles major players in the basal cell carcinoma treatment market based on various attributes such as company overview, financial overview, SWOT analysis, key business strategies, product portfolio, and recent developments. A thorough market share analysis of major companies operating in the basal cell carcinoma treatment market is provided in the report. Key companies profiled in the report include Sun Pharmaceuticals Ltd., Valeant Pharmaceuticals International, Inc., Mylan N.V., F. Hoffmann-La Roche Ltd., and Merck & Co., Inc.